So, I think it is fair to say that anyone who cooks as much as I do has a fair amount of recipe disasters. 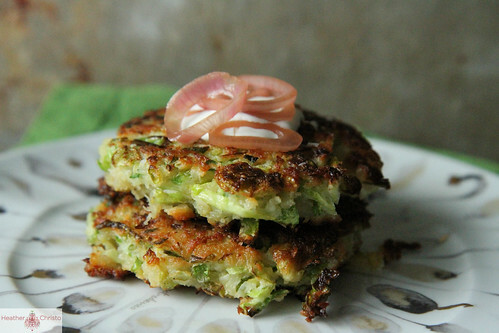 One of mine that still plagues me is my total inability to make a good zucchini fritter. Like, I have messed those up 10 times over for the last 4 summer’s. 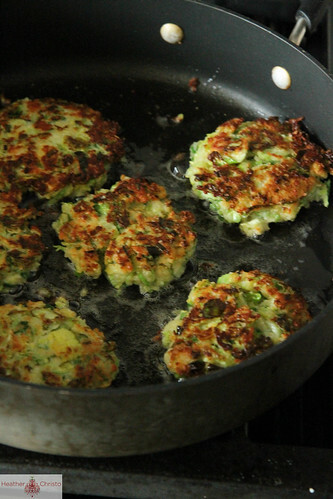 Look, it is the middle of winter and I am still thinking about those zucchini fritters. Sometimes I get mad about it and plot my revenge on those dang doughy, raw battery, falling apart but somehow still hockey pucks. And this was it. Sorry Zucchini. I think you are just too wet. And Brussels Sprouts are not wet. They are light and fluffy with a perfect shredded texture that is like lace and is just begging to be fried up to crispy perfection. Crunchy panko keeps them crispy and the goat cheese and egg binds everything together while lending tremendous flavor. Finely shred the Brussels sprouts (I find this easiest to do with a sharp knife). 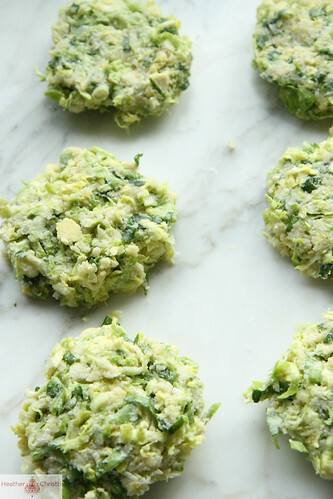 Toss the green onions, flour and parmesan cheese with the Brussels sprouts. Add the eggs and combine partially, then add the panko and mix well. Add the goat cheese and taste a little bit. Season to taste. 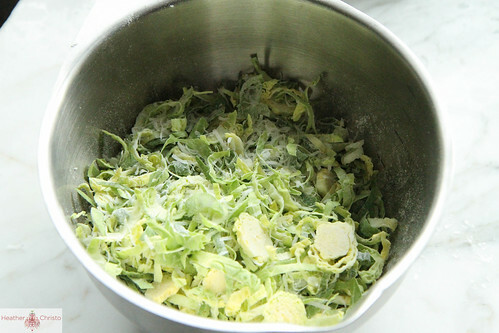 Mix until the Brussels sprouts form cakes that stay together. Make 6 fritters. In a large nonstick pan, add ¼ cup vegetable oil and heat over medium heat. When the oil is hot, add the cakes and cook them for about 2 minutes, or until golden and crispy. Flip them and finish cooking on the other side. Serve them immediately or place them on a sheet pan in a 300 degree oven to keep hot until you serve. 1. Finely shred the Brussels sprouts (I find this easiest to do with a sharp knife). Toss the green onions, flour and parmesan cheese with the Brussels sprouts. 2. Add the eggs and combine partially, then add the panko and mix well. Add the goat cheese and taste a little bit. Season to taste. 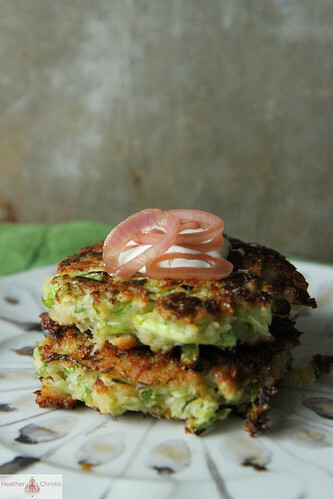 Mix until the Brussels sprouts form cakes that stay together. Make 6 fritters. 3. In a large nonstick pan, add ¼ cup vegetable oil and heat over medium heat. 4. When the oil is hot, add the cakes and cook them for about 2 minutes, or until golden and crispy. 5. Flip them and finish cooking on the other side. 6. Serve them immediately or place them on a sheet pan in a 300 degree oven to keep hot until you serve. When I was a kid, you couldn’t get me to eat a Brussel sprout at gunpoint…but now? I love them. I made some for Christmas roasted with walnuts and (veggie) bacon–they were fabulous. 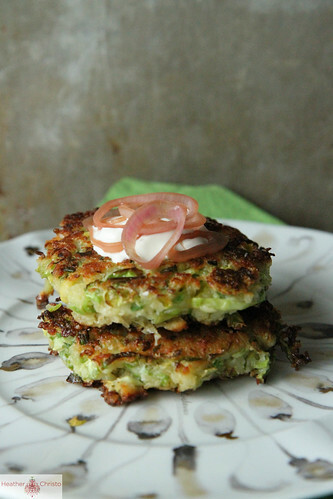 These fritters look delicious and simple to make. I’ll be picking up some ingredients for this tomorrow. Yumm-y! Oh good Jules! I don’t think I had them the first time until I was an adult, and those were the soggy grey lumps my grandma made. Now they are my favorite. Just love them! obsessed with brussels sprouts – this looks amazing! will have to try it! What can I say? Sounds like a healthy, nutritious and delicious recipe! Thanks for sharing it with us. Ha! We’ve all had our share of recipe flops. Me? I can’t seem to make aioli to save my life. The egg and oil never emulsify. It’s not pretty. 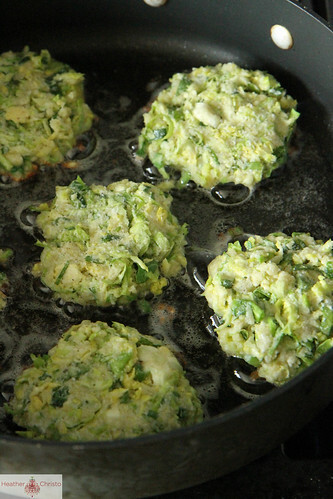 Look on the bright side, brussel sprout fritters are waaaay more interesting than zucchini fritters, right? I can definitely confirm lots of disasters in my kitchen too! 🙂 It’s ok, though–we get so much amazing food to make up for it, right? These fritters look great! 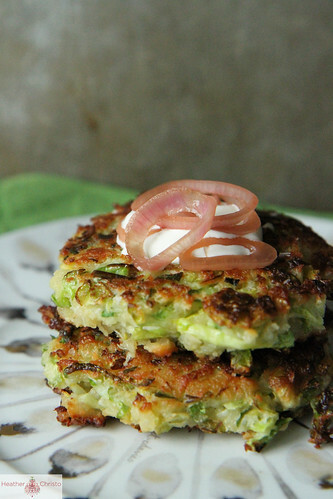 I’m not sure why I have never thought to make Brussels sprouts fritters. These look so good, Heather! Great recipe. I made these (without the toppings) and I had to add one extra egg to keep the fritters together (I think I had a little more than 2 cups of brussels sprouts). Other than that, they were amazing! No one could tell they were eating brussels sprouts! Thanks for the recipe! Awesome recipe. Always looking for new Brussels sprouts recipes. These look delicious! Looks great! Do you think it would work as well with cabbage instead of Brussels sprouts? Thanks! Wonderful recipe. I used almond flour and meal in place of the flour and panko crumbs. Wow. What a wonderfully creative idea! I love the powerful flavor of brussels sprouts so much that I normally just steam and salt them. Other treatments I’ve had get away from what makes them great. 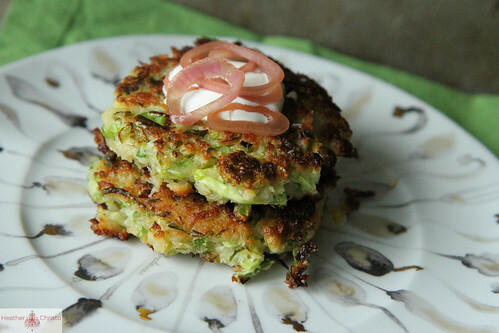 I’ve made corn fritters that keep the spotlight on the corn, and I’m happy to say that this does exactly that for the sprouts. I went with cheddar, because I was concerned that the goat cheese would step on the sprout flavor, and I loved it. But, you seem to have really good instincts in the kitchen, so I’m going to have to give it another try with goat cheese. Thanks again for posting this! !